There is a lot of talk about saving money when grocery shopping right now. But what about saving time? “Grocery shopping” appears as a single line item on your big-picture to-do list. However, it’s made up of several steps. Nothing in life should ever take more than 2-3 minutes. The issue is, we have 4-500 things to do each day that all take 2-3 minutes. Before you know it, it’s 8:00 and you just started boiling water for the pasta. It’s going to take about 300 words worth of rambling before this little nugget of wisdom is revealed. Don’t be such a lazy ADD’ed-out blog reader! Stick with me. I promise I’ll make it worth your while. Take inventory of your pantry and your refrigerator. Plan some meals for the week and make your list. Collect all the plastic bags you’re going to drop off in the recycling bin at the store. You have all these plastic bags because you always forget to bring the reusable bags. Get in your car and drive to the store. Turn around and go back home. You’re not going to forget those reusable bags again! Sit in your car for 3 minutes. Someone is blocking traffic in the parking lot waiting for a parking space 10 feet closer to the store. Find a parking spot close to the cart return area. Whew! Even on my most caffeinated days, it can take up to 3 hours. Shopping during off-peak hours will shave some more time. So will making a list, and planning a week’s worth of meals. If you’re stopping at the store on your way home from work, pre-planning is critical. This is also one of those times when it’s definitely OK to “outsource” some food. 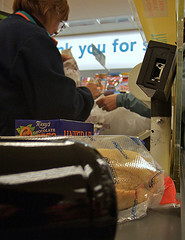 You’ll spend more money on unnecessary impulse purchases than you would on a quick snack. Without hunger to worry about, you’ll also perform the task of shopping much faster and with more clarity of purpose. I went through the trouble of mapping one of the two main Publix locations that I shop at. I thought I would make my list according to the sequence of the aisles. How many people actually do that. I know I don’t. Each main group is also organized further. All like items go together. The items end up getting bagged together. You can put them away much more efficiently. The benefit of leaving non-food items for last will help you when analyzing what you really buy. In order to create an effective budget, you have to know how much money you’re actually spending on food. Having those non-food items at the end of the receipt makes this accounting much easier. The beautiful thing about this little trick is that it doesn’t take any additional time or effort to implement. You’re performing one of the necessary steps in the grocery shopping process, but you’re doing it with a little forethought. This advance thinking saves you time at subsequent steps.